Okay, I admit that I have a little crush on the Barge brothers and the delectable cocktails and dishes they bring to the scene. Teamed up with Phil Capaldi, the boys have a new addition to the family in a hidden, reformed alleyway along Campbell Parade. 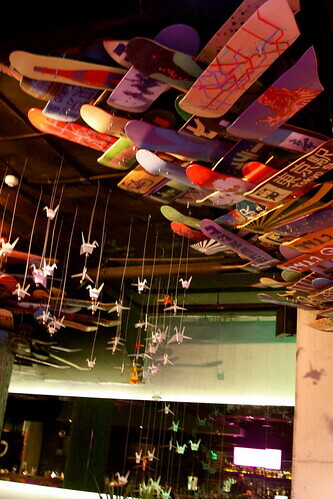 Walking in, your eyes are casted to the 400 and something skateboard roof, flying origami cranes and an enticing long bar at the back. We kick off with some chilled beverages and in true LL Wine & Dine style, there’s an innovative cocktail menu. Tonight I’m on the Tokyo Pop, a fruity mix with a cheeky popping candy rim. The boys are on tap beer, Orion, which is of course Japanese. 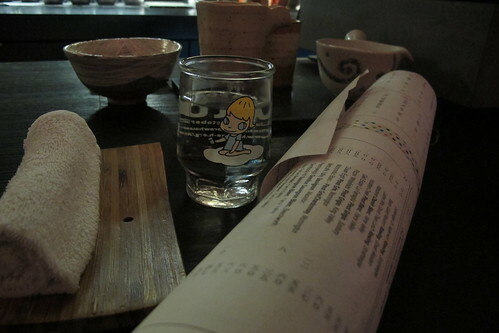 The menu is designed to share and there’s a mix of old and new Japanese. The entrees and mains are a modern take, while the sushi menu keeps it simple but offering good ol’ favourites with a sprinkle of PaperPlanes magic. Entrees kick start with dishes of edamame, gyoza and salmon nachoes. 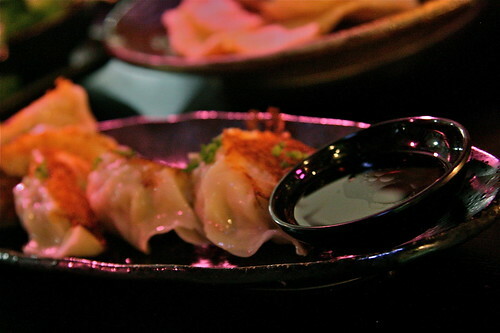 The homemade gyoza is limited each week and are served with a chili oil and ponzu mix; the ponzu adding the perfect amount of tartness. 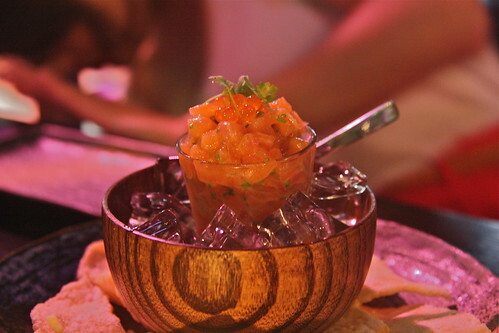 Th salmon nachoes are kept cool in a wooden bath of ice and served with crispy prawn crackers. There’s a selection of sushi and sashimi to choose from; my favourite is the spicy tuna with the refreshing inclusion of apple while the spider roll has a firey kick with hidden fresh wasabi. 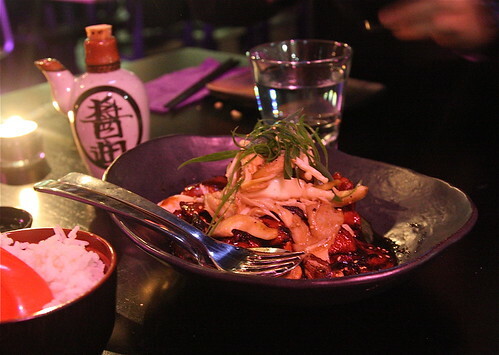 The mains are hearty and keep us warm from chill and rain – the sake flamed teriyaki chicken is deceptively flavoursome and perfect with a bowl of rice and the sauteed mushroom mix. 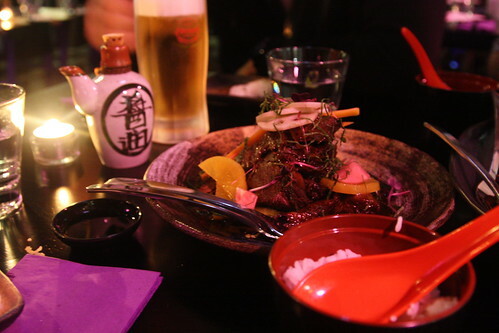 The braised beef short ribs are perfect for the lazy as they are off the bone swimming in a sauce of yakiniku (sake, mirin, soy) – all balanced with the sourness of pickled vegetables. 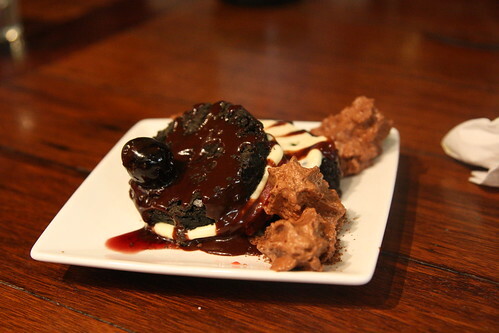 The desserts are adventurous. Our Tokyo POP plant is a lemon cheesecake in disguise, all of which would have been complete if there was a super crumbly biscuit base which we were all digging for! The black egg on the other hand, is delectable. It is a layered “egg” of macadamia nut oil, coconut milk curd and a floating disc of chocolate sauce (there’s not much, so you have to fight for it!). 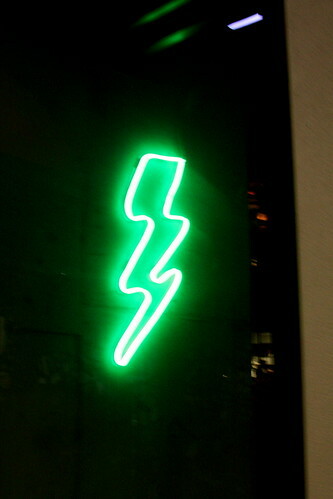 Follow the lighting strike and have a cocktail, or two. 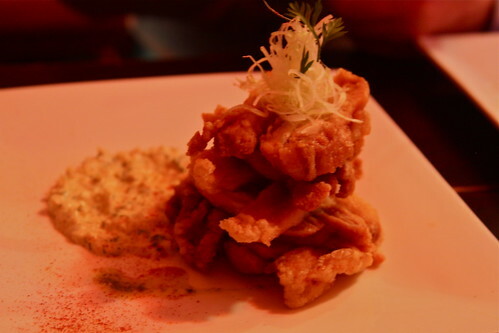 Please give Mr Waduka back his missing hat, because there aren’t many restaurants around that meet this standard of high quality food, presentation and incredible service. Valet parking, a peaceful bar with deep, sinkable leather chairs and a central Japanese garden that transports you from the hustle and bustle of Sydney’s CBD. 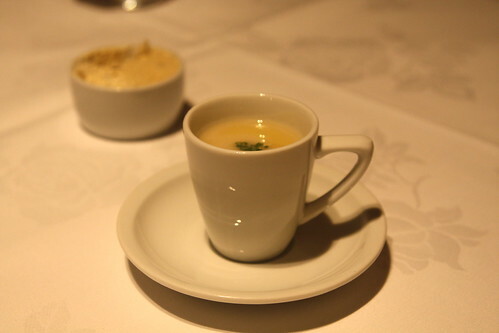 Our first course are espresso cups filled with warm potato soup with coddled (partly cooked) quail egg sitting at the bottom. Mix, mix, mix, we’re told. 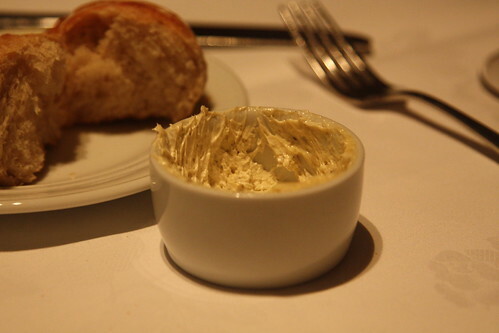 Creamy and indulgent. The oysters are an additional course, but worth the while. 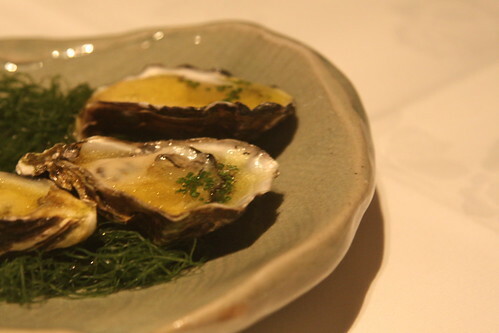 The Pacific Oysters are from the Central Coast and swimming in a small pool of rice vinegar and ginger. Ah it’s amazing how simple dressings need to be when you’ve got fresh oysters. Shortly after, a small wooden spoon, wooden coaster and cup magically appear. 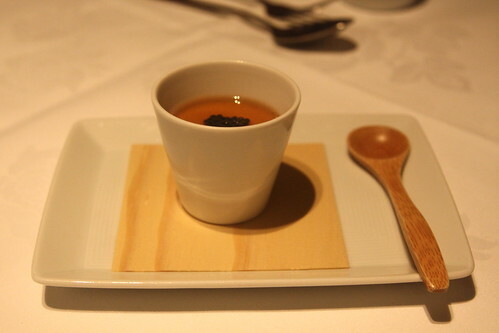 After inspection, it’s a silky egg custard filled with dashi broth and topped with avruga, a caviar made from herring. The tastes of mushrooms fill my mouth, but there’s not a mushroom in sight. 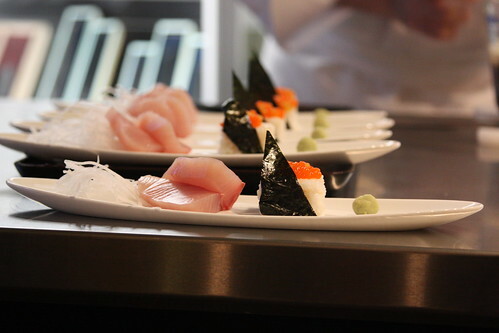 Next up are paperthin sashimi slices of Kingfish drizzled with a blackbean, orange sauce and ribbons of spring onion. 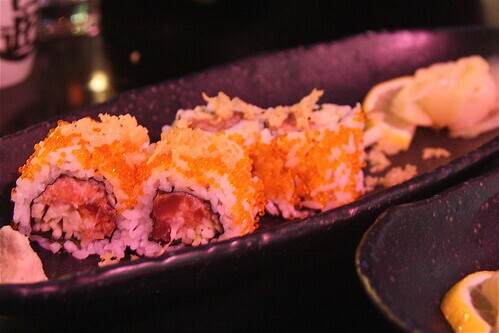 It’s an amazing fusion of Japanese and Chinese flavours. 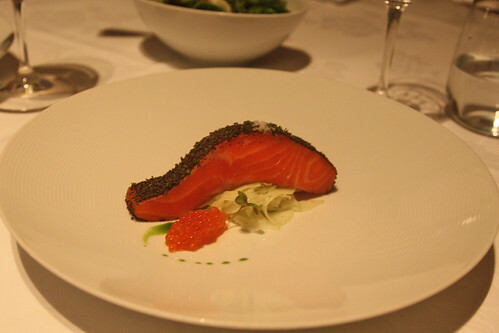 The only dish that remains on every single menu is Tetsuya’s signature Ocean Trout. From the waters of Macquarie Harbour, the Ocean Trout has a thin coat of kombu. We’re told that kombu, a staple of dashi broth, is slowly and continously grounded until it can be sifted again and again, and mixed with coriander seeds and salt. 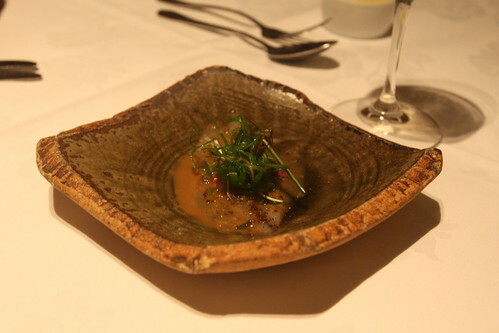 A perfectly cooked piece of grilled snapper is next, and it is brought together with scampi pieces and smoked peppers. The fish breaks apart easily with the edge of the fork and the sweetness of peppers and scampi isn’t too overwhelming. Spanner crab and foie gras are my favourite connoactions together. 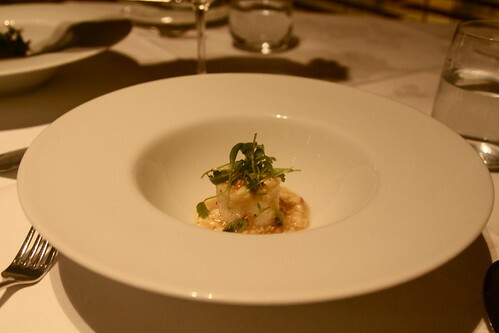 Gentle pieces of steamed crab sit together on a bed of silky bean curd, fatty foie gras and hints of Junsai. 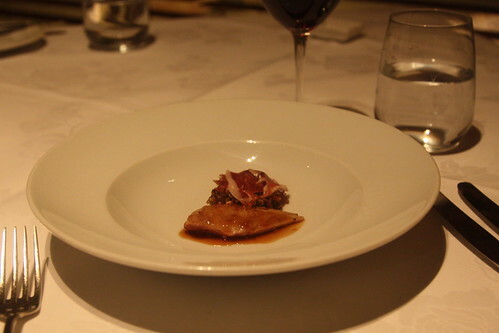 The land proteins begin, and the first dish is a medium rare breast of quail served with puffed barley rice and Jamon, a Spanish cured ham. The smokeness fills the table, and there’s something so earthy and comforting about the textures and flavours of this dish. 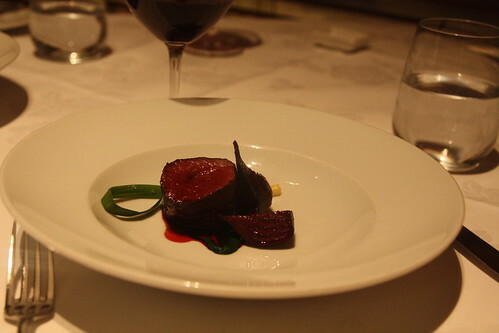 Our seared venison loin seems somewhat sous vide before it’s seared as it’s perfectly medium all the way through. Wedges of beetroot scatter the plate with beetroot jus and swirls of chlorophyll. I rarely (no pun intended!) have anything that is this rare but it’s beautifully done. Our waitress brings over a stack of spoons, unraveling each spoon like a babushka doll. 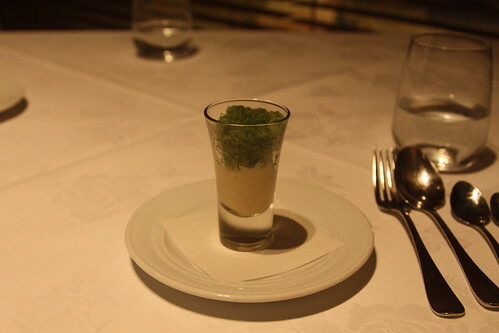 A shotglass of hay infused ice cream topped with a sorrel granita. When mixed through, the sweetness of the ice cream works well with the tartiness of the granita. 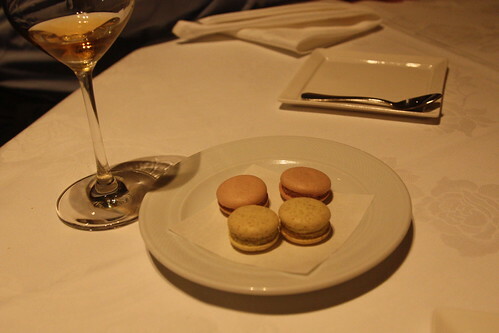 Not my absolute favourite but it works well to cleanse the palate before out trio of desserts. Twin desserts present itself, and I giggle inside. We’re kindly advised to start with the tarte tatin; four layers of goodness. A scoopful of gelato, crunchy sweet crisps, cream and hidden apple chunks at the bottom. It’s married with a pudding which is absolutely devineeeee. It’s not as sweet as I first imagined, and we’re both scraping the ramekin clean. 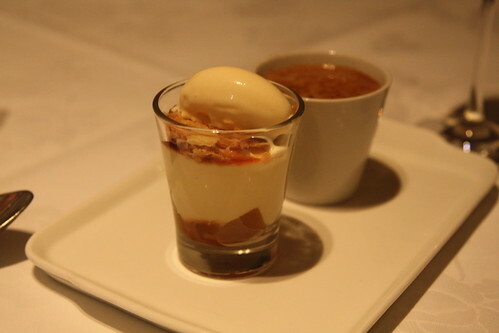 Almost bursting at the seams, our final dessert plays all the notes; from the savory tones of the carrot cake (which was so incredibly moist..), tanginess of the cream cheese ice cream, salty crushed peanuts and sweetness of the caramel swirl. Wow, what a finish! Tetsuya’s is old school glamour and invention. 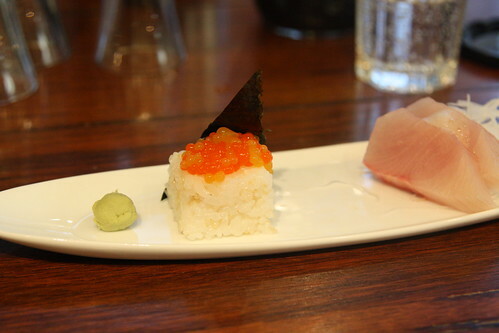 Tetsuya’s is focused on perfecting technique, matching flavours and just getting it right. No fancy tricks, no puffs of smoke, no oranges that taste like apples, and apples tasting like oranges – it’s just good ol’ amazing food, wines and kind, knowledgeable service staff. There’s always an occasion for live music and good food; blind first dates, reunions, meeting the in-laws; all potential cases for long silences and awkward pauses. 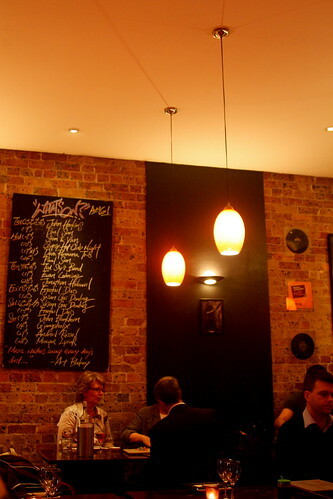 Jazushi’s been around for a while now, nestled on a corner on Devonshire St. 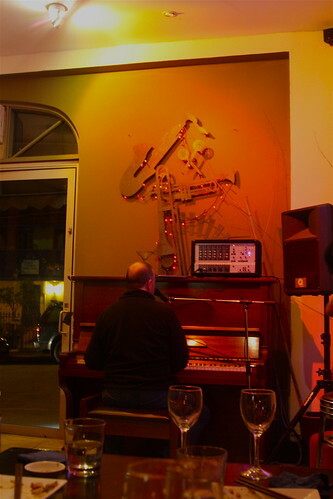 The interior is bare with exposed brick walls and a few framed records and paintings, but the ambience is warm and chilled out at the same time. Dinner tonight is a farewell for my colleague and in particular from my team, so her bright smile and samba moves will be missed. 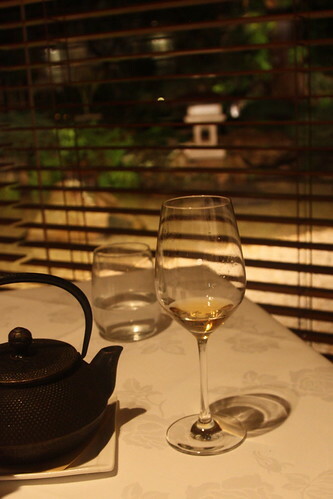 The set menu is organised at $55 per person with all dishes served banquet style. 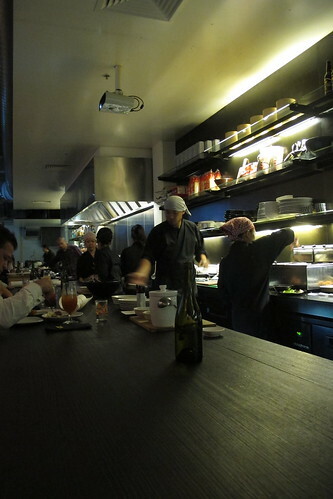 Japanese at Jazushi is contemporary but keeps true to its roots. 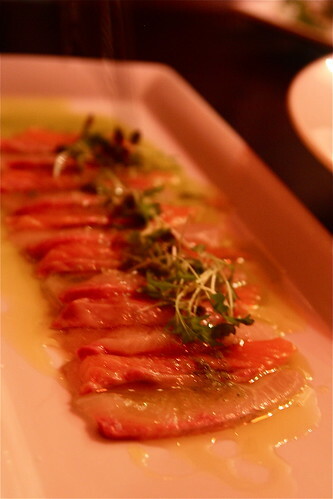 The salmon & kingfish carpaccio is a minefield of flavours with even the pickest eaters munching on a few slices. 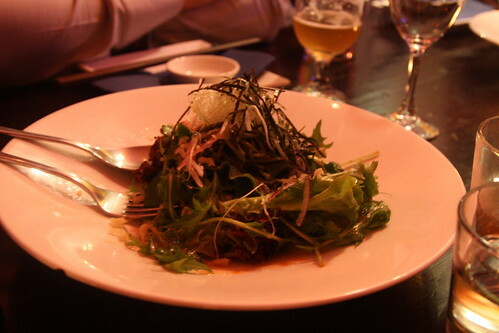 The green tea noodle salad is intriguing, a cold noodle mixed through a mix salad with a sweet soy onion dressing. Seemingly bland on paper but filled with amazing flavour for such a humble salad. 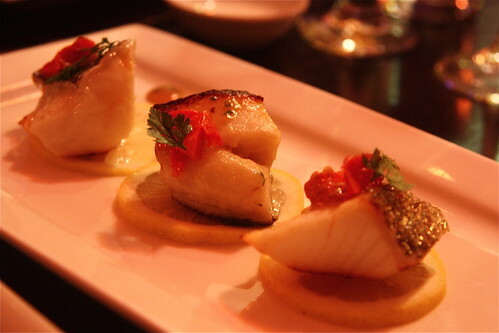 Next are bite sized pieces of silver cod flavoured with saikyo sauce, which is one of the most amazing fish dishes I have ever had and, my favourite of the night. 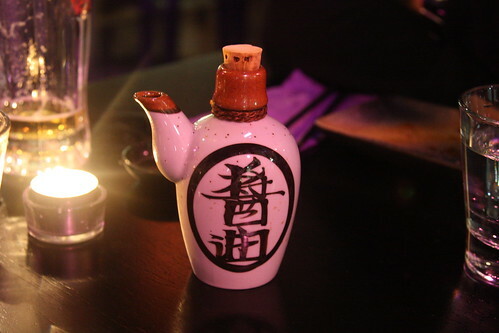 Saikyo is a sweet miso based sauce, using more rice than soybeans and uses less salt than normal misos, reducing it to a sweeter, buttery taste. 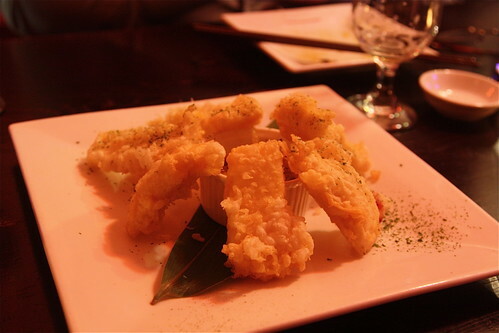 Cheese is not one of my favourite things (being lactose intolerant explains why…) but I had to give the tempura a go. Cheesy, but not as intense had I imagined and the batter was devilishly crunchy. Dishes of pork belly begin to roll out and we all salivate over its tenderness. 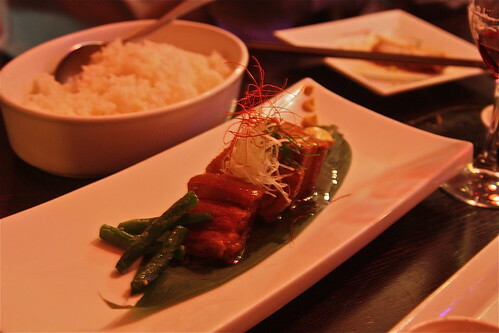 The pork belly is melt-in-your-mouth tender as it’s cooked kakuni styled; meaning cubes of pork belly simmered in dashi, soy, mirin, sugar and sake and being slow cooked, all the fat begins to break down, mmm! The dishes didn’t stop there with the final dish of Wagyu beef steak served with sweet teriyaki and garlic sauce, and by this time I had fallen into a food coma. 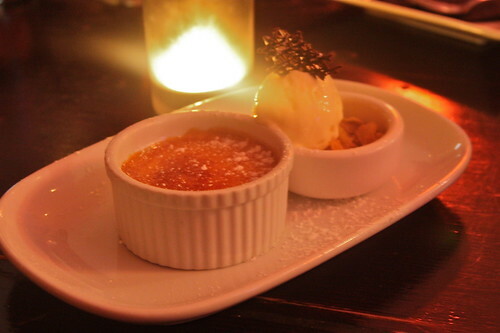 The top of the night, it’s a creme brulee in the tiniest ramekin, and it’s no wonder the Japanese stay so thin by keeping their dessert portions! 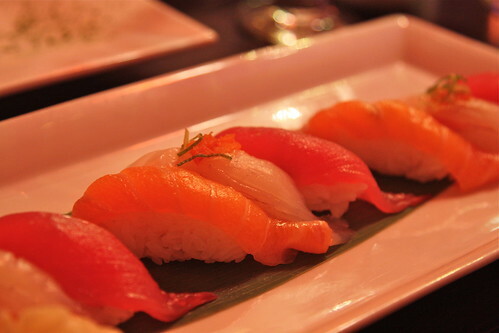 Perfect for delicious contemporary Japanese delights and sways to live jazz music every night. Melbourne bars really make you work hard. To earn this feast and Asahi; we persisted through a number of spins, till we landed in front of a set of stairs, a heavy glass door, through a black curtain to lead us to the gorgeous vertical dining room of the Izakaya Den. We take a seat at the bar (and it’s a must) to watch all the Japanese chefs dressed in black and coloured bandanas in action. Unroll the architecture map sized menus and your eyes wander up, down and across the variety of sakes, shochu, wines and beers. An izakaya is a casual bar in Japan with shared bar snacks; all the dishes are categorised as small, hot, cold and chargrill. 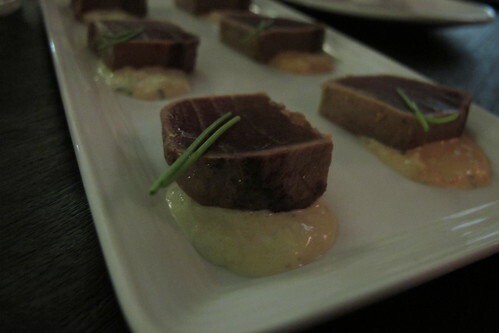 For entrees, the spicy tuna tataki sitting on a creamy garlic soy fire up our tastebuds. Tataki is type of technique to prepare fish and meats, particularly tuna, that slightly seared. Not a usual tuna fan, but this dish worked really well with the garlic soy to give it a firey kick, and one of the favourites of Izakaya Den. 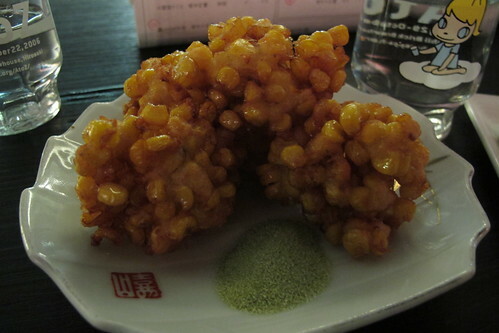 Next are the simple and sweet corn clusters which were amazing. Sweet, crunchy and light. 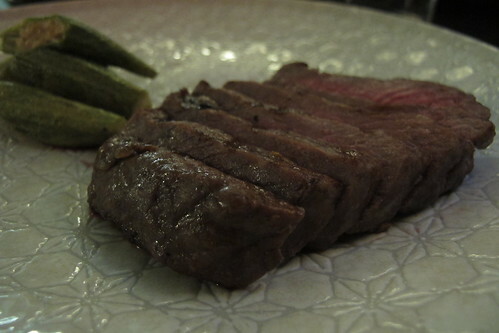 For mains, the wagyu beef is off the char-grill menu, simple and plain, but served with a sweet soy that made all the difference – it adds a sweet touch to a plain steak, Jap style. 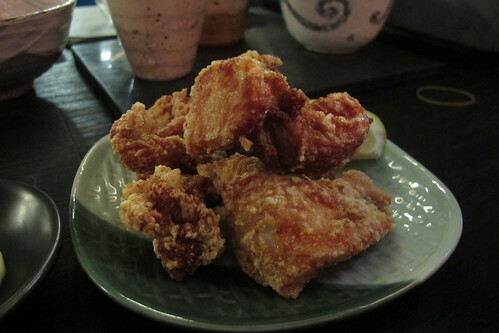 Not crazy but the den fried chicken certainly is. It may look fried, bubbly and all things oily, but the different herbs and spices used to coat the chicken pieces are delicious. 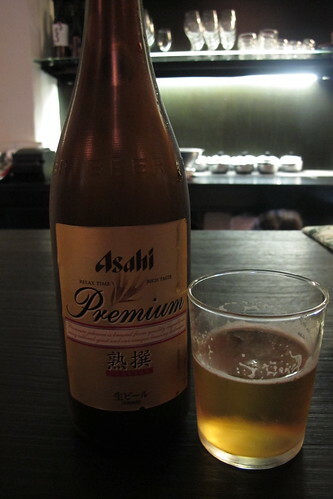 Best downed with half litre of imported premium Asahi. While watching at the bar, my dining companion became fascinated by the Paco Jet machine on the counter. It’s a food processing machine that makes ice cream in a flash. So… dessert with ice cream was a no brainer. 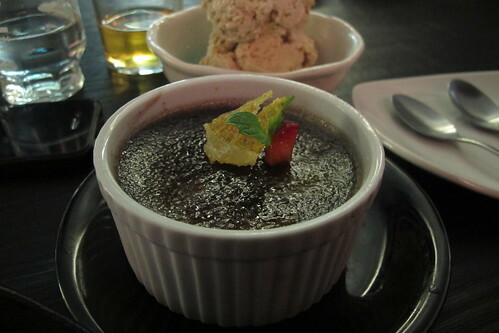 To keep with the Japanese theme, dessert starts with a black sesame brulee with orange peel strings; and it tastes like good ol’ black sesame, and not the artificial kind. The brulee top cracks wonderfully and it’s absolutely addictive. 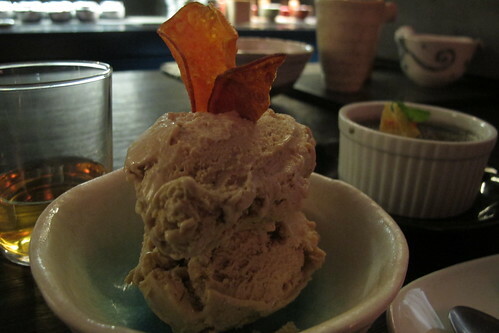 We dig into the houjicha ice cream, an in-house made ice cream using the Paco Jet machine with roasted green tea. 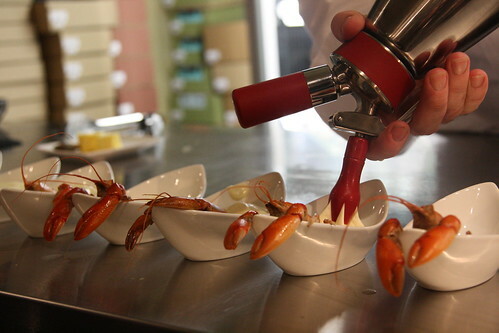 The flavours are subtle and so incredibly fresh – no icicles or wateriness. 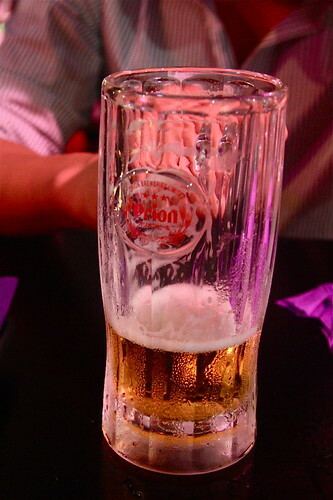 Izakaya Den is as close as a Tokyo bar can get… including whether you can find it! I know I’m probably behind the times but recently I’ve taken greater interest in area of molecular gastronomy particularly after expanding my food adventures. The best thing I would imagine for a chef is seeing the element of surprise this art brings to their diners. 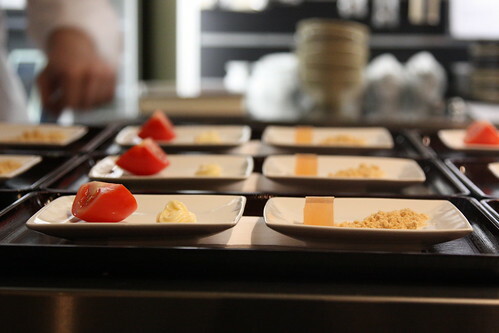 Apart of the Crave festival, I attended an intimate class at the Chef’s Armoury playing around with Japanese flavours and molecular gastronomy. First off the mark was a technique that I was particularly interested in learning how to do properly – having tried and sort of, succeeding, I wanted to know all the inside tricks and secrets. 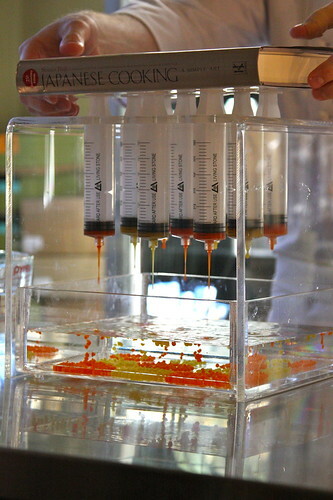 Sphereification is combining a flavoured liquid with sodium alginate and dripping this into a water bath of calcium chloride – then into some clean water to wash off the chloride. If they float, you know it’s not right as there is air trapped inside. And, it’s best to make them just before serving. As kingfish sashimi was on the menu, a sauce was in order. 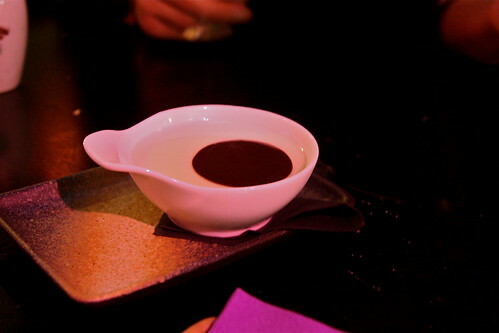 Ponzu, a light soy sauce commonly served with gyoza was made into a foam. And as water does not foam on its own, it’s crucial to add a emulsifier such as soy lecithin to the solution, hand blend, and viola! It’s as easy as scooping the flavoured foam onto the dish just before serving. The dish was fantastic and something we could definitely replicate in our home labs – although, I would have loved to have a greater explosion in the mouth, with a more intense and surprising flavour in the caviar. It’d be interesting to try this with some crazy flavours. This dish was definitely more intriguing than the first, with a cube of savoury jelly and very sandy sesame. It reminded me of the grounded peanut and sesame treats we would devour during Chinese New Year. Another very commonly used method in the molecular gastronomy world is reverse sphereification – where calcium chloride is combined with the liquid and submerged into a water bath of sodium alginate (so the opposite to sphereification!). This allows larger spheres and greater bursts of flavour. 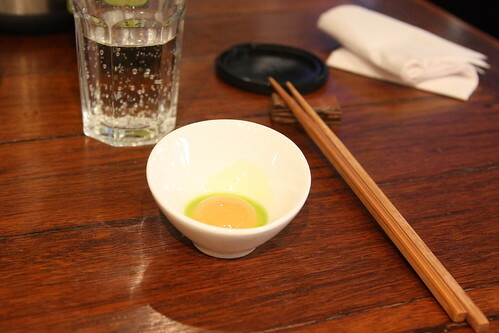 On the menu were spheres of miso soup that was taken down like a sake shot. Once bitten, the warm miso soup bursts into your mouth. It definitely drew a “wow”. To make spheres warm, submerge them into a warm water before serving. Sous vide has been around for quite some time, and it can become quite a heated dinner table discussion amongst foodies – some love it and some hate it. It’s all a matter of preference, like how do you like em eggs? The concept is French meaning “under vacuum” and involves cooking proteins in a vacuum sealed bag submerged in a temperature controlled water bath. The argument for sous vide also dervives from the point that food is best cooked in their own juices to maximise and maintain the flavour. Chef Leigh makes the good point that when carrots are boiled, the water tastes like carrot water but the carrots then taste absolutely bland and unflavoursome. 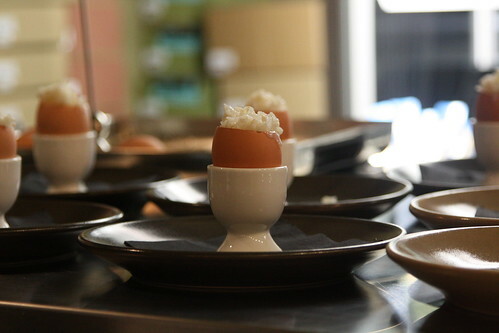 Using the sous vide machine, Chef Leigh demonstrated how to cook the one ingredient that determines the skill of a chef, eggs. Using an egg clacker to remove the top of the eggs, the inside slipped out effortlessly leaving a clean empty shell. Eggs were cooked in the sous vide machine at 64 degrees for an hour. The outcome was a take on the humble chicken oyakodon. At the bottom of the egg was a slightly runny yolk and white, topped with onions and sushi rice drenched in a absolutely addictive sauce of mirin and white soy, served with sticks of chicken. My favourite savoury dish of the night alongside the warm miso spheres. Another sous vide dish is demonstrated using whitebait and good ol’ carrots and parsnips. The whitebait was delicious and perfectly cooked, falling apart as my fork sliced through and the vegetables did indeed taste like carrots and parsnips, although they’ve been cooking for an hour. 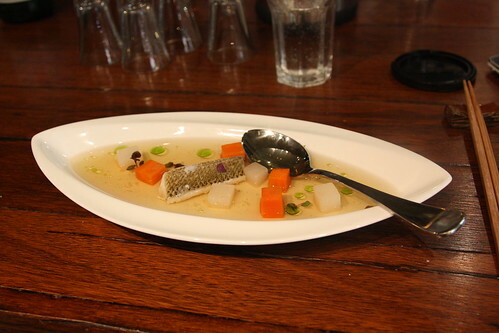 The broth was a simple as white soy sauce, mirin and dashi – lightly flavoured so the fish and vegetables could be the stars of the dish. Chef Leigh explains how crucial for any cuisine it is, to cook with produce that is in season. 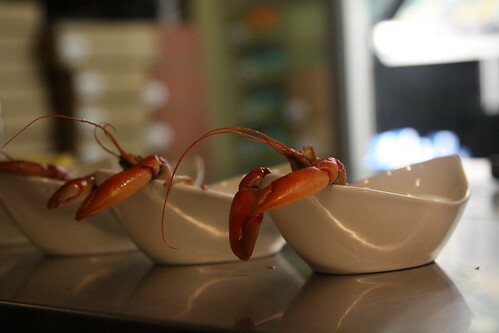 With our luck, yappies are on the menu tonight – cooked with miso paste and butter in a iron caste pan and served with a potato, olive oil and yuzu flavoured foam. 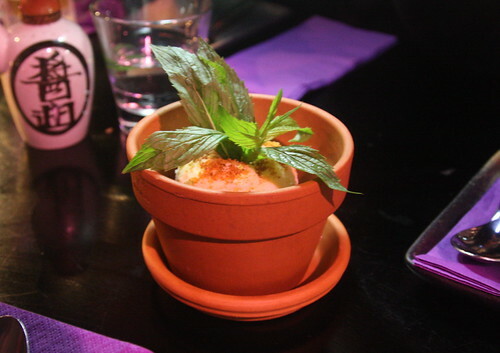 Yuzu is a Japanese citrus fruit that could be described as the baby of a lemon and a lime. 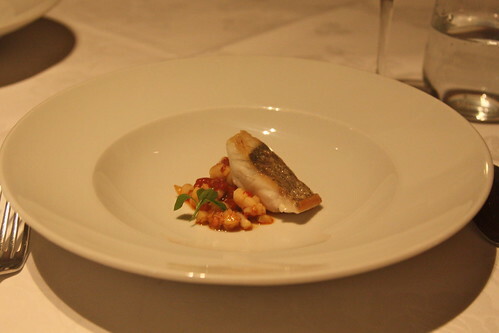 Presentation for this dish was brilliant, humour is the best part of dinner. The yappies were delicious with a hint of the miso butter, although the foam was just a little too sour for my liking. Onto dessert, Chef Eddie serves us a gorgeous dessert that leaves the table silent for a solid five minutes with the occasional hmm and aahh. 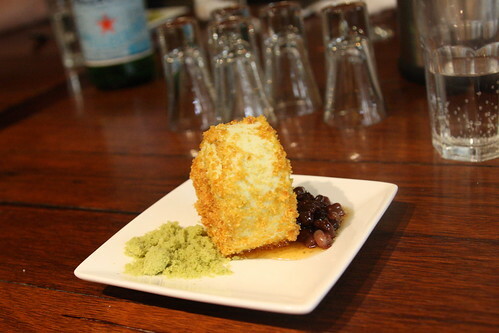 A green tea soil served with a green tea and honey parfait rolled in a macadamia praline with a side of azuki beans. 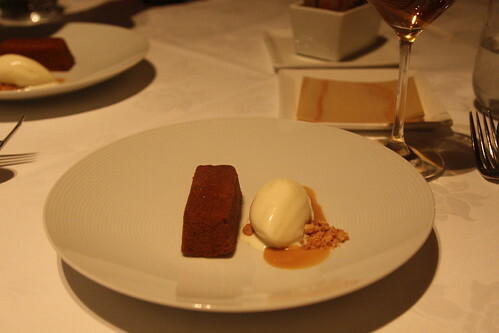 The best desserts have a balance of flavours and most importantly, textures! I love how the praline left a crunching sensation while the parfait was soft and just melted in the mouth. Second dessert for the night was a DIY blackforest cake and being in a molecular gastronomy class, it was only fitting to ensure it was really a black cake… Eddie places plates of ingredients like charcoal cake bases, Chantilly creme, chocolate mousse, cherries, chocolate sauce and a sour cherry gel. 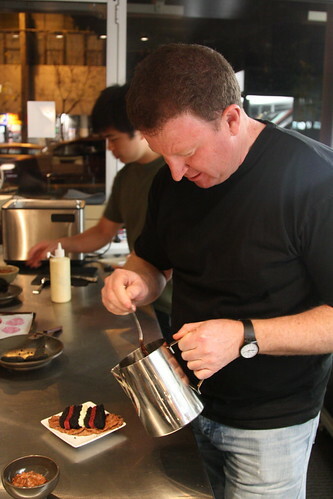 The charcoal didn’t really taste like much, but entire cake had amazing flavours and it wasn’t as sweet as I had anticipated it to be – my favourite layer had to be the sour cherry gel which was amazing in texturally in the cake and flavour. Amazing class, both entertaining and delicious! 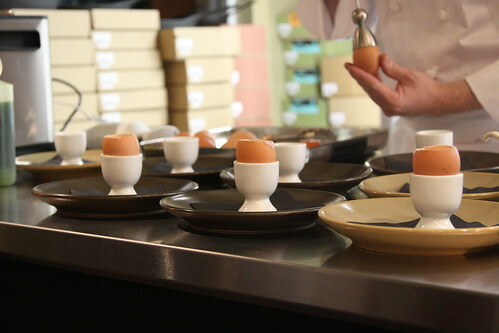 Classes now ended, but keep checking Chef’s Armoury for any upcoming classes.